Today’s recipe is a knock-off of a dish my step-mom makes. She’s an amazing cook and makes a killer Caesar dressing. No joke, she often makes more than necessary for the meal so that Mr. Crumbs has some leftover for his weekday lunch salads. 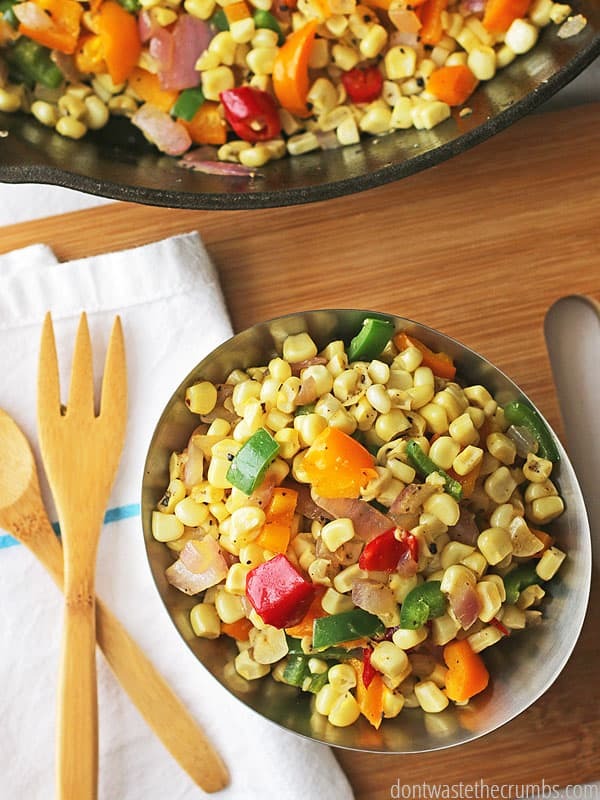 Anyway, corn is another Spring/Summer vegetable that doesn’t need much of anything to be added to it in order for it to be good (unlike brussel sprouts!). This recipe takes a deliciously sweet vegetable and transforms it into a savory one. It may not have many ingredients, but it provides ample flavor for any meal, including our taco night and leftover taco salads! In a saute pan on med-low heat, cook garlic and onions in olive oil until onions are not quite translucent. Add pepper and cook until onions are translucent and peppers are soft. Add corn and continue to cook until corn is cooked through. Add a decent shake of red pepper flakes, plus salt and pepper to taste. Disclaimer: This post contains affiliate links. By making a purchase through those links, you support the ministry of Crumbs without any additional cost to you. Thank you for supporting Crumbs in this way! Read my full disclosure statement here. Finally…I’ll be able to make the wonderful corn I enjoyed at your home with Stacie and the kids the last time I was in town…hint…I’m coming back for Mother’s day and the wk that follows…coconut rice recipe would really be appreciated too! Can’t wait to make the corn. Oops, I found the coconut rice on a previous blog. Thanks, can’t wait to try to make it myself. Judy! I’m so glad you stopped by and found both recipes. 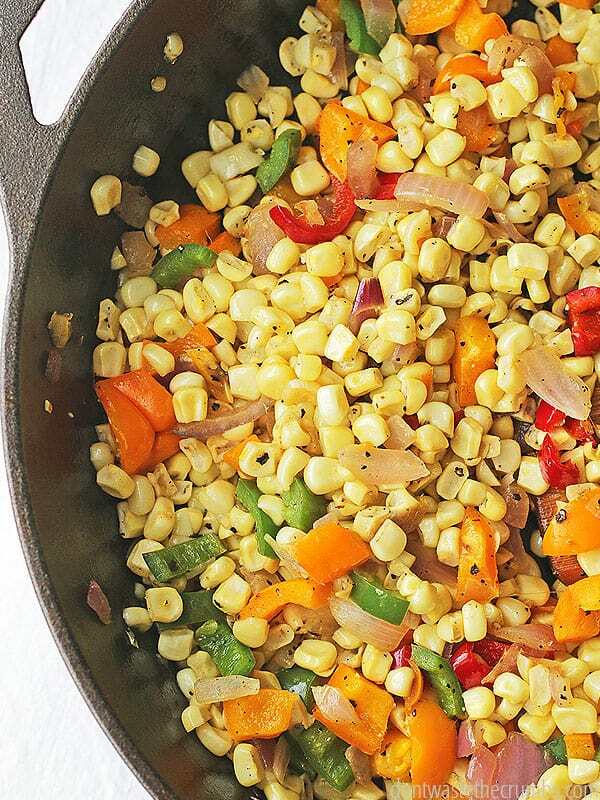 Let me know how your corns comes out… and I’d be more than happy to make tacos for you, Stacie and the kids again! Spaghetti looks like it’s very popular among MPM participants. We’re having Spaghetti and Meatballs tonight. With being so easy and so comforting, it’s always a family favorite! 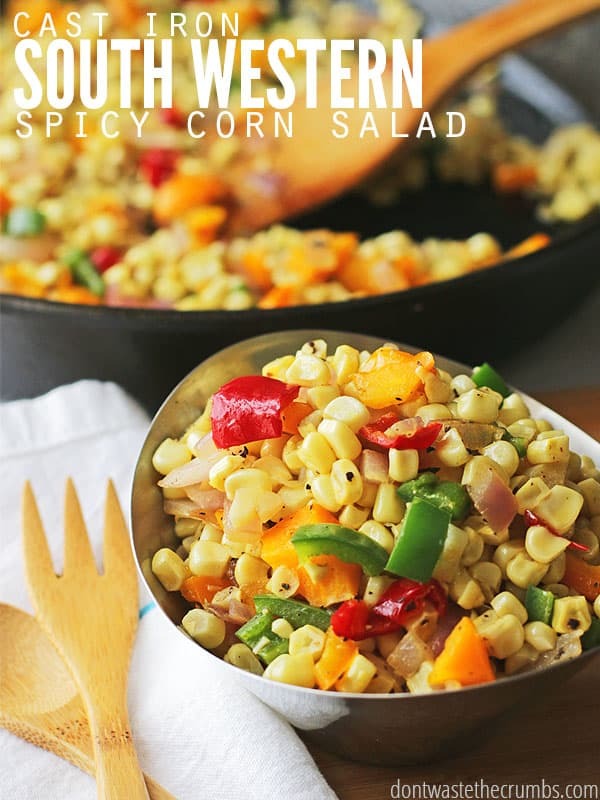 If I use frozen corn for this recipe, should it be thawed first?